A botanist’s wonderland awaits exploration in this canyon. Mt. Bikers also seem to enjoy its rocky challenges. Sayles Canyon is one of those areas outside the wilderness, yet having all of the features of the wilderness, except for the crowds. Perhaps we should keep it a secret place. The trail connects the PCT to the Camp Sacramento area but I prefer to access it from Sierra-at-Tahoe ski resort. This trail also hits the Bryan Meadow Trail which leads also to the PCT. This trail also offers the best view, I think, of Pyramid Peak, directly west across the canyon. Directions: Go 46 miles from Placerville to turn right at the Sierra-at-Tahoe sign at Phillips. Go 1 ½ miles to turn Right at the gates. Follow for 2 miles to a dead end circle, park there. The trail passes through here. 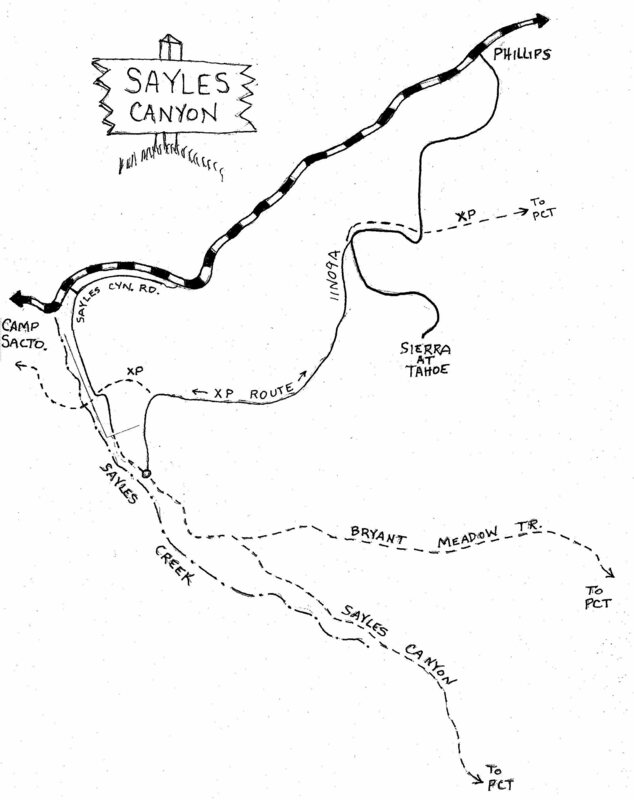 You can go downhill towards Camp Sacramento, a mile away, or uphill to the Pacific Crest Trail (PCT) 4 miles one way. There are beautiful old forests with many mini meadows along the way. Take a glimpse back towards the South Fork Canyon and enjoy a great view of Pyramid Peak in the distance as you climb a steep section about half a mile from your car. Soon you find the fork with the option of taking the Bryan Meadow trail direction. Here you can make a loop going up one trail and returning to here on the other, making about 11 miles total. Access to the Pony Express Trail, and its bridge crossing Sayles Creek, is about a half mile below the trailhead, this offers a trail connection to Strawberry or Echo Summit. History: There is evidence in the way of wagon ruts to support the claim that early pioneers used Sayles Canyon as a wagon route. Apparently still visible south of the Sierra Ski Ranch along the edge of the canyon, I’ll have to see for myself.